CLICK ON THE DROP DOWN BOX ABOVE ( LOCATED BESIDE "Type:") TO SEE ALL THE OPTIONS AVAILABLE. Quality needles that will fit and work in your sewing machine. Not all needles that are currently on the market will fit and work correctly. Because of a reduced shaft size, some needles will come out while you are sewing and can cause damage to your machine. 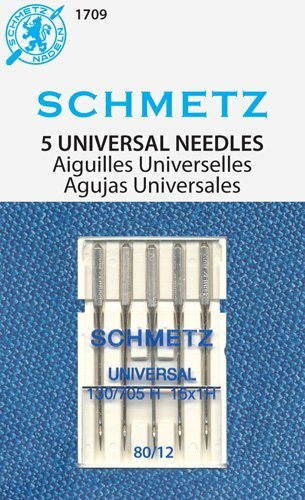 Universal Needles are for general sewing. Microtex Needles are also called Sharps. Size 60/8 and 70/10 are good for machine quilting with a fine thread. Nova uses 60/8 with silk thread for machine quilting. Size 80/12 is good for a 50 weight thread like Superior Master Piece. Size 90/14 is good for machine quilting with a heavier thread like Superior King Tut.